A bunch of my coworkers have been sick lately, and I started to feel like I was coming down with something last Thursday and Friday. I was very determined not to let myself fall ill yet again this year, as I had had quite enough illness with that bout of mono that caused me to temporarily lose my job, thankyouverymuch. So I went on an Immunity Quest. I had Grant buy me FOUR shots of wheatgrass juice from Jamba Juice on Friday afternoon, and then I got myself another four shots on Saturday and another four shots again today. And guess what? No sicky! 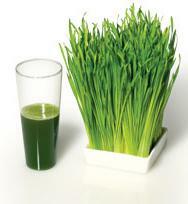 So I suppose our kitty is not the only wheatgrass fanatic in our household, after all. Maybe we’ll fight over it.